The Onkyo ND-S1 iPod dock is a new arrival to Onkyo's extensive range of Hi-Fi and AV gear, and includes some distinctive technologies of its own. The ND-S1 is more accurately described as a 'digital media transport' and in the manner of the Wadia 170i bypasses the digital to analogue conversion of the iPod and will output a digital signal to the DAC of your choice. The Onkyo is in many regards an even more minimalist proposition to the Wadia, as it has no analogue audio out at all and is entirely reliant on a DAC or AV receiver to function. This paring back of features does mean that the ND-S1 is less than half the price of the Wadia and comfortably the cheapest iPod transport on the market. It does have some interesting additional functionality, however, including a USB input that not only allows the connected iPod to sync with a PC whilst in situ, but will also play material from the PC by converting the signal to output over optical or coaxial. This is a boon for anybody wishing to incorporate a PC into a hi-fi system that does not have a USB DAC. The unit feels well constructed and has some clever touches such as the dust cover for the iPod mounting and a remote link that allows it to be controlled by other Onkyo products. 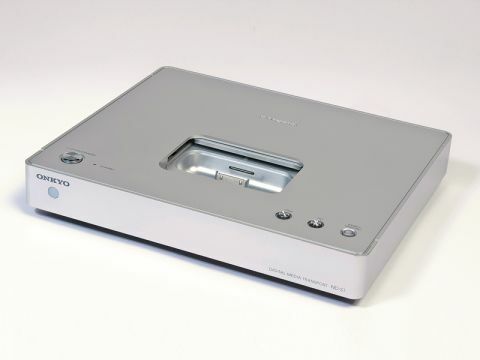 The ND-S1 was tested with a latest generation iPod classic and an iPhone into the digital inputs of a Cambridge Audio 840C and an Audio Note DAC Zero. With a variety of material ripped to AAC lossless, the ND-S1 gave a thoroughly convincing demonstration of the potential of the iPod as a digital transport. Flicking between the CD in the transport of the 840C and the digital input, where the ND-S1 was plugged in, revealed no real difference in presentation between the two, while listening to the excellent, self-titled One eskimO album. The ND-S1 reproduced the album with the same gorgeous sense of space and realism as the CD had and there was no sense of a softening of the bass, or lack of detail that can occur with analogue output docks even replaying AAC lossless. Essentially, the ND-S1 only has the sonic properties of the DAC it is connected to – be that the calm detailed sonics of the 840C or the more soulful, if less accurate warmth of the Audio Note. Equally impressive was the performance of the ND-S1 with more compressed material. MP3s at 320K and AAC tracks were still an entertaining listen and even smaller files were not rendered unlistenable by the Onkyo. The ND-S1 then destroys any equivalent CD player in terms of convenience – the iPod classic will hold roughly 170 lossless albums, which can be browsed at leisure via the Onkyo remote (and any additional albums in iTunes could be replayed via USB) and, of course, you can then pop a pair of earphones into the iPod and keep listening on the move. The ND-S1 also demonstrated an unusual feature in which it is capable of replaying the Spotify application on an iPhone and therefore accessing a vast collection of music held online. The limited bit-rate is clearly apparent, but the ND-S1 demonstrates the principle of a music on-demand server admirably. That this functionality is not achieved at the cost of sound quality and is available for £150 is all the more impressive. This then, is a brilliantly thought-out and well-executed product that should appeal to many listeners, both as an addition to an existing digital setup, or for the bold, a complete replacement for a CD transport.